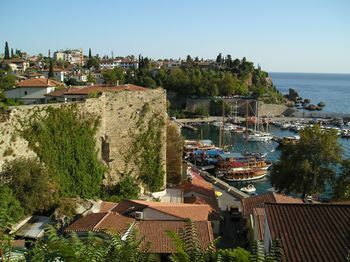 Antalya is the closest airport, served by inexpensive flights from Istanbul. (As low as $50, early booking is also available for lower prices). Being 10 km from the city from Antalya, Antalya Airport  (IATA: AYT; ICAO: LTAI) caters for the charter flights full of holiday makers. Airlines that serve Antalya include: SunExpress  (dozens of flights from all over Europe), Corendon Airlines  (leisure airline), Transavia.com (lowcost and charters from Netherlands, France and Denmark), AtlasJet  (domestic flights), Turkish Airlines  (plenty of flights from Ankara and İstanbul-Atatürk), Aeroflot  (daily flights from Moscow-Sheremetyevo), Ukraine International Airlines  (several charter flights a week from Kiev) to Antalya. Britain is also represented by numerous Charter firms such as Thomas Cooks and Airtours. Condor  also serves Antalya. The new airport Gazipasa, Alanya airport opened up in 2012 and is based near Alanya, Antalya. It is a large investment by the Turkish government to relieve some of the pressure from tourist traffic through the main Antalya airport. The easiest and cheapest way to get to town is with the Antray tram leave from outside Terminals 2 and 3 to the Otogar via the city center and old town about every 20 minutes. If staying in Kaleici (old town), then get down at Ismetpasha, which is only a short walk away. Travel time is about 30 minutes. Tickets cost 2 TL.As of March 2011, a taxi ride between the airport and the city centre will set you back € 18 (38 TL ) during the day. You can also prefer transfer companies  in order to avoid any scam. Other, more wallet-friendly options for the airport transportation include: Havaş buses can be used which are less expensive but more frequent, and they are departing on the hour from "Güllük PTT" (10 TL). There are public buses from the airport (line 600, "Terminal-Otogar") which leave on the half hour and cost 4 TL [as of January 2016]. You need to purchase a contactless payment card at the bus driver, which costs 5 TL, so expect to pay 10 TL at the bus driver [as of March 2016]. To catch the public bus from the International Terminal you have to go to the domestic terminal (300m, just turn right when you leave the International Terminal), there is a small blue "D" sign next to a larger ficus tree. The blue "D" sign next to the taxi stand in front of the International Terminal won't get you anywhere; waiting there usually attracts taxi drivers (telling you truthfully: "There is no bus leaving here!") offering a ride. The Turkish bus system is comprehensive and you can get about anywhere from anywhere. Better spend a few more liras and you will have an unforgettable journey. Ulusoy has buses with seats that resemble business class in airplanes. There are also other bus companies, including Kamil Koc, Truva, Metro and otobusbileti selling bus tickets of Ulusoy Turizm and other seventy bus firms. Some companies have an onboard WLAN. The terminal is separated in two buildings. The larger building obviously houses the long distance bus routes, and the smaller building to the left (west) serves for shorter distance routes including Serik, Manavgat, Side, and Fethiye. Fares are low. Simply show up at the bus station (“otogar”) and announce your destination. From most cities, there are an overnight bus options (with Antalya ). There are regular buses destined for Antalya that run along the coastal roads and stop at tourist towns such as Kas and Fethiye. Most travelers arrive in Marmaris from Rhodes, Greece, then bus it overland. You can also take a ferry from Kastellorizo, a tiny Greek island just off the Turkish fishing village of Kas. The nearest train station is in Burdur, 122 km north. Although Turkish State Railways (TCDD)  ceased to operate direct passenger trains to Burdur from Istanbul, you can still buy a ticket for Pamukkale Express, which has sleeper berths as well as a coach car. You should get off the train in Dinar station and transfer to the connecting bus provided by TCDD (no extra payment other than your train ticket). Once in Burdur, all you need is to catch a minibus for Antalya, which takes one and a half hour and costs 9 TL/person one-way. All this may seem a bit of a hassle, but it is still an option if you are on a tight budget, keen on reducing your carbon footprint or hold an Inter Rail pass. The Pamukkale Express is NOT operating as of April 2009 and it is unclear when or IF it will resume service. For example, when a bus has destination number as AF04, it runs between Aksu and Tıp Fakülesti. Antalya Transportation System also offers alternative method for mobile device users. The system uses a QR code. It is possible to logon to this website link and use your device as payment method. The website has English and Russian versions. You can charge your deposit by credit card and benefit from the advantage of paying less if you transfer to another bus or tram. You don't need an internet connection, all you need to do is to save the QR code to your gallery. In Antalya, buses pass from anywhere to any destination in the city. Fares are low and most buses offer air-conditioning and TV even for short routes. To travel to remote places you may need to travel to the bus terminal first. The bus terminal has its own buses with distinctive blue stripes. As of 2011 bus terminal to city to airport travel (Bus 202, "Terminal-Otogar") is possible every 30 min. There is also Bus 600 which runs from the Otogar to Konyaaltı Beach, then through the town centre towards Aksu. The closest bus stops to the Old Town would be on Ali Çentinkaya Cd. whıch ıs a few mınutes of walkıng from the Old Town. Dolmus literally means "filled up". Dolmus is a large cab, a station wagon, a regular taxi or a minibus that travels a certain route. Most major public transportation stations have a dolmus station, where you just take a seat in the dolmus that travels your desired route. In Antalya dolmus does not wait until it fills up. Instead, it is scheduled. However, if empty dolmus will move slowly hoping to find more passenger. Still it has to abide its schedule and cannot stall much. There are taxi stands all over the city where the drivers have their base and tea pot. Each taxi is metered and there are two different rates. After midnight (24:00) till morning (06:00) it will cost 50% more than the daytime fare. For popular destinations there are price lists showing the rate in Euro. A fair rate is about TRY 0.8 to 1 per kilometer. You can also negotiate with any taxi driver to be your private tour guide. You also have to pay the gas money. This option could be quite expensive but if you have the money, it is worth it!.Besides,you can make pre-booking antalya airport transfers antalya airport transfers by private taxi companies. The new tram system ("AntRay") currently (04/2011) consists of one line, serving the route Fatih-Otogar-Muratpaşa-Ismetpaşa-Meydan every 7min during the day. Trams are comfortable, air conditioned and feature WiFi, although a Turkish cell phone number is needed to register for the WiFi. To get to the Kaleiçi or to the interconnection with the historic tram line, get off at Ismetpaşa station. Tickets (1.75TL) can be obtained at the stores around the stations or at specific AntRay-counters (e.g., at the Otogar). It is possible to pay via the Antalya contactless public transport card; these cards can be recharged at vending machines near the tram stops (at Kaleiçi, for example). Vending machines speak Turkish and English. If you're unsure, just ask the helpful station guards. Car rental is available in the bus terminal, air port and city center. It is advised not to use car to reach city center (specially Cumhuriyet, Atatürk, Isiklar streets, Sarampol street and old city), as finding a car park and the way people drive (sometimes you feel like you are in the race tracks) might be difficult. Be sure to abide non-parking restrictions, the municipality is very strict about it. There are destination signs on roads to help travelers. Also most of the younger locals know English will be pleased to help about your destination. You can also obtain city map from tourist information desks in the city center. Using bicycle in crowded roads might be dangerous and tiresome(especially in summer as the temperature hits high 40's at noon (100F-120F). However, there are a few bicycle-only roads passing beside the sea having incredible views. Most of Antalya's historic buildings can be found along the narrow, winding streets of Kaleiçi, the old quarter. Historical, architectural and archaeological sites of note include: Yivli Minaret, Karatay Medresesi, Hıdırlık Tower, Ahi Yusuf Mescidi, Iskele Mosque, Murat Paşa Mosque, Tekeli Mehmet Paşa Mosque, Balibey Mosque, Musellim Mosque, Seyh Sinan Efendi Mosque, Hadrian Arch, and the Clock Tower. Many structures date back to the Hellenistic era. Also The Antalya Museum has a notable archaeology collection. Shop at great malls; Terracity, 5M Migros, Özdilek and Deepo Outlet Center. The hill of Tünektepe, with a height of 618 m/2009 ft, west of the city has a splendid panorama of Antalya. On the top of it, there is a hotel, a rotating restaurant, and a nightclub, although the club is mostly open for private parties only. You can take a short scenic cruise on the Mediterranean from the boats anchored in the harbor. Assume that the right price is about half of the first price you are offered. Don't believe their assurances that the boat is leaving right away--the boat will leave when the owners think there is no reasonable chance that more passengers can be persuaded to board. Morning cruises tend to be calmer than afternoon cruises. In Belek which is 45 km's from Antalya city center you can enjoy playing golf as this is Turkey's golf center with more than 30 well organised golf courses. Lara Golf Club, is a good option as there is no membership required and they do have a nice spa as well. The usual souvenirs are kilims, blue eyes, fake designer clothing, shoes, aromatic herbs, waterpipes and more. If you feel the need to visit a modern shopping mall, TerraCity (which is on the way to Lara) and MarkAntalya (close to the old town) do have all of the international designer shops you could wish for. In TerraCity, here is even a power boat dealer. Pharmacies sell most prescription drugs completely legal just over the counter and at low prices. A wide array of generics (drugs containing the same agent as a brand medicine, but from less known companies) is also available. Best-sellers include Viagra, Prozac, Ventolin, Xenical, various contraceptive pills and antibiotics. The export of antiques or objects considered so is strictly forbidden and will cause a lot of problems not to say hefty fines to those caught when leaving the country. Possession and possibly even commerce in Turkey is legal - just the export is banned. Be on your guard and don't believe sellers who may try to convince you of the opposite. Also, customs back home target more and more faked goods such as video, CDs, shoes, watches and the like. The odds of being caught are minimal, but you should know that you are moving on illegal terrain. Tudors bar (kaleici): Women are warned to steer clear of this bar. The ownership is very strict on clothing and will throw out any woman that does not dress conservatively. Do not be confused by the prostitutes that do frequent the bar. Better bars are to be found outside of Kaleici, in Lara or Konyalti. Food is extemely cheap, and good. Full meals will cost you about 10 to 20 Turkish Lira, about 5 to 11 US Dollars. Service is amazing, and only matched by its genuine friendliness. Antalya has good seafood restaurants as well. One caveat to be aware of is to make sure the quoted price is the same as the price written on the menu. Antalya has a lively nightlife in summer. Options include bars with nargile (water pipe), games, live music and sitting around, discotheques with glamorous visitors, etc. On Konyaalti's Beach Park one club follows the next. Some of traditional houses of Kaleiçi (Old City) has been turned into bars, in which a bottle of 'Efes' beer costs around 10 or 12 TL depending on the place. Their gardens shaded by trees offer a nice escape with a beer from the peak of summer heat. Raki is a traditional alcoholic beverage that tastes like licorice. Make sure you do not drink it fast otherwise you will be out quickly. You can divide Antalya into two main areas (as far as tourists are concerned). The Old Town (Kaleiçi), as its name implies, is full of character and has beautifully restored buildings with small guest houses and more evidently luxury boutique hotels. Lara to the east of the city has many 4/5 star beach hotels that cater for the all inclusive holiday market. Both are good options, depending on what you are looking for. Of course, there are very good hotels outside of these areas, but not in the density that Old Town/Lara have. You can just stroll around (with luggage) and you won't have to wait for long until you'll be offered 'Pansiyon' (Hostel) accommodation. Almost every second house in the Old Town is a small hotel (many of which are of very high standard, with small swimming pools and smart restaurants). A couple of years ago summers used to be packed but those days seem to be gone. The big share of visitors to this region are package tourists being channelled through 'all inclusive' programs outside the city. The going rate for a double room with en-suite is TRY 20-35 per night/room. At Lara, a suburb to the east of Antalya, there are a lot of stunning 4/5-star hotels along the beach. These generally cater for the 'All inclusive' package holiday traveller. However, they can also make an excellent base for those wanting to visit places away from the resorts, but return to some luxury in the evening. Being a package offering, they can end up being relatively cheap. All of the hotels fall into the Splurge category. Antalya Police Department has a "tourism police" section where travellers can report passport loss and theft or any other criminal activity, they may have become victims of. They have staff multilingual in English, German, French, and Arabic. Kemer is about 45 km south of Antalya and is a popular, touristic seaside region with historic places, nightlife, and accommodation. Currently (as of Jan 15, 2016), you can reach Kemer by "Sea Bus" on Saturdays and Sundays only. Antalya departure times (winter timetable): 9:30, 12:30, and 15:30. Kemer departure times (winter timetable): 10:45, 13:45, and 16:45. Cost: 10 TL Deniz Otobüsü website, in Turkish. Boats depart Antalya from the harbor in the old part of town. It is also possible to get to/from Kemer by dolmus for 8 TL. There is an express as well as a local service (which makes stops in Beldibi and Göynük). The express service takes less than an hour and the local service takes about 1.5 hours. Both services are otogar to otogar, but the local service makes many stops along the way. In Kemer, you can catch both the express and the local dolmus at the Clock Tower, rather than going all the way to the otogar. At the clock tower, buses leave every 15 minutes from 7 am on. Side to the east is popular with golf links and luxury hotels. Kaş which is about 2 hours drive from Antalya can be another excellent choice for extended holiday if you decide to run away from the whole crowd. Kalkan which is half an hour further west of Kas. A beautiful upmarket harbour town with cobbled streets and high quality restaurants. Nearby Patara has the best golden sand beach on the Mediterranean coast, and can be visited even if you are not staying there. Cirali is a coastal town even closer, with several mid-range, quiet pansiyons to stay at, with pleasant gardens. The beach at Cirali is protected from development because sea turtles come onto shore every year to lay their eggs. The beach at nearby Olimpos is also a nice, pebble beach, as is the one at Adrasan. Accommodations in Olimpos are more backpacker style, with tree houses especially popular with younger travelers. Demre further west from Olympos, and is the site of the St Nicolas Church, assoicated with the real Santa Claus (don't miss the larger than life Santa Claus statue in town.) Also just outside Demre are Lycian rock tombs in the cliffsides. 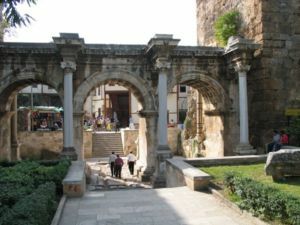 The Antalya region has some of the finest Roman ruins in the country, including Perge and Aspendos, with the largest, most well preserved Roman amphitheater anywhere. This page was last edited on 31 July 2018, at 07:20.